Adelaide Hotels Overview: Popular Adelaide Hotels. Adelaide, the capital of South Australia, boasts a fine range of hotels, motels and serviced apartments. Many of the international groups have a presence here, including Hilton, Hyatt, Novotel, Stamford and Bass Hotels. The city has a wide choice of accommodations, ranging from 1 star private hotels through to deluxe five star establishments. There are hotels in the city, in the Adelaide CBD, in the suburbs and on the beaches. The range of hotels in Adelaide is as good as any city in the world. Room tariffs are quite reasonable as international traffic and corporate travel into Adelaide is somewhat less than in the mainstream cities of Sydney and Melbourne. There are many fine hotels in Adelaide to choose from. We've selected just a few to provide a broad selection and then we suggest a hotel search engine where you can explore Adelaide's hotels to your heart's content. 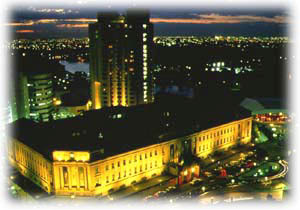 Some of the grander hotels (5 star) in Adelaide include the Hyatt Regency, the Hilton Adelaide and the Stamford Plaza. More modest hotels include the Novotel Adelaide Hotel on Hindley (in Hindley Street of course) and the Holiday Inn Adelaide in South Terrace. For apartments seekers one of the more popular apartments hotels is the Saville Park Suites, which is the former Holiday Inn Park Suites. Then there's the Lakes Resort Hotel on the lakes at Westlakes, less than a half hour's drive out of the city. Whatever your preference, you'll be sure to find a hotel to suit in Adelaide. For the complete range, information, rates and availability of most Adelaide hotels, go to the International Hotel Search.com search engine. Hire a bicycle and explore the surrounding parklands or the Torrens Linear Park - or, better still, both. Dine on the perfect apple or punnet of strawberries bought from a street vendor while you walk to the Jam Factory Craft and Design Centre, or to the cafes and boutiques of the East End of Rundle Street. See literary reputations made - and shattered - over a cold beer during the Adelaide Festival's Writers' Week. Take the O'Bahn bus to Tea Tree Plaza, the bus to Cleland Conservation Park in the Adelaide Hills and on to Aldgate, or the 1929 vintage tram to Glenelg and eat fish and chips on the beach. For the young at heart, parasailing provides a wonderful view of the Adelaide coastline. If you're a snorkeller or scuba diver, explore the Port Noarlunga under water aquatic reserve. Take a trip back in time to the Port Adelaide historic precinct, with its atmospheric old pubs, and maritime and railway museums. Explore the natural mysteries of the St Kilda Mangrove Trail, or the man-made mysteries of the Investigator Science & Technology Centre. Take a guided tour through the Central Market, a riot of colours, smells and flavours and dine in one of the 50 or so restaurants in neighbouring Gouger Street and Chinatown. Pretend you're Pavarotti and hum an aria or two with a romantic gondola ride on the River Torrens - before visiting the Festival Centre to hear the real thing. Late at night, enjoy a coffee in one of North Adelaide's O'Connell Street cafes, or dare to be different by eating a pie floater at one of Adelaide's unique pie carts. Take in the magnificent panoramic views from the Mount Lofty Summit. View Australian wildlife at its most active on a guided dawn or sunset walk through Warrawong Sanctuary. Wine tasting is a must in the Wine State whether in a wine bar and by the glass or "buy" the bottle from one of the 16 wineries in the Adelaide Hills and Plains. And when you've done all this, chance your remaining dollars in the splendid-looking Adelaide Casino. If visiting Perth in the near future, be sure to visit the newly opened Quest Apartments, one hour's drive south of Perth, at Mandurah. This brand new complex has studio rooms, 1, 2 and 3 bedroom apartments. Want to see what Australia has to offer? Visit the Australia Supersite!